Take a bowl add okra, flours, chilli powder & salt. Mix gently. Serve with any kind of rice . those look lovely.. i love okra and will do anything for it! :) will try this one..i have always stir fried it. never tried the deep fried version. Okra is not my fev veggie, but the only time i ate it was when mom fried like this. I can eat okra any time. I love the crispier version of Okra. Love this recipe. Will try it soon. This one must be quite scrunchy without the usual slimy okra feel. Really crispy and yummyyyy.... Ya! 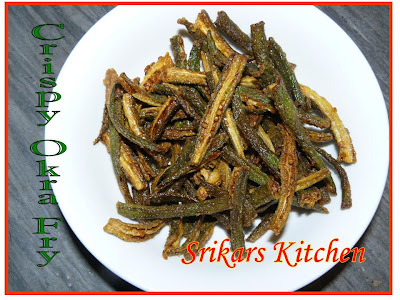 i tried your okra fry today and i have posted it in my blog. That must taste truly awesome... have never deep fried it in oil so far - how tempting. I have tried this at a company guest house...except that the cook would give a tadka after frying the Okra. 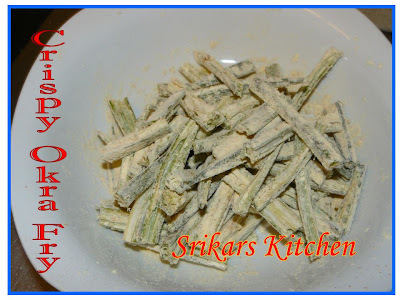 Thank u for visiting my blog..Okra looks so crispy..mouthwatering..
Love fried okra. The masala sounds delicious! Wow this looks innovative and awesome. I love the way u slit open the orka's. I will try this soon. Fruit salad also looks gr8 and refreshing. 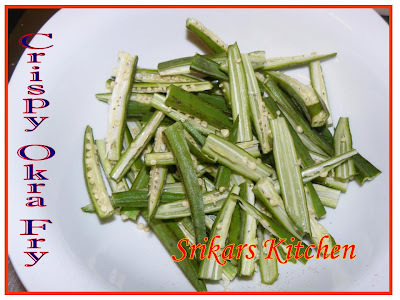 This is a great, simple way to make okra fast!